Kokeshi dolls have been produced in Tohoku District for more than 170 years. Originally, most of Kokeshi dolls were purchased by peasants at the hot springs, that peasants stayed there for a hot-spring care. Kokeshi was the most acceptable souvenir for their girls or their neighbors. There are some variations of shape and drawing pattern for Kokeshi dolls, which are categorized 10 groups. Those variations due to their family or traditional history, since most of craftsmen faithfully succeeded their master's or father's forms and drawing patterns. In line of this nature, those groups have built the geographical distribution. 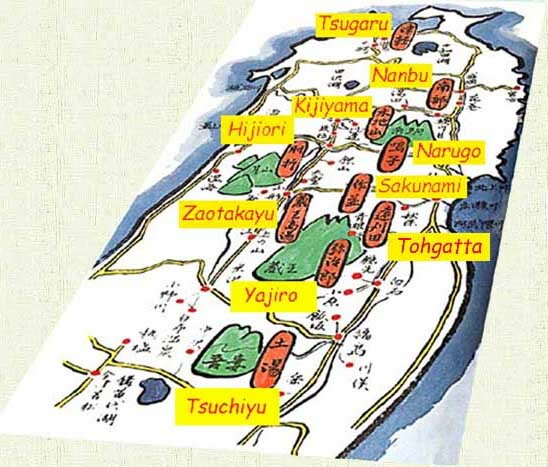 This map shows the most considerable Kokeshi producing areas, which areas are corresponding to the centers of 10 groups. Click yellow box on the map, and you can get the more details of each group and its representative example.